Oppgave i internasjonal engelsk på vgs om forskjeller og likheter mellom demokratene og republikanerne i USA. Oppgaven presenterer og drøfter de to politiske fløyenes holdninger til blant annet skatter, helsevesen og våpen kontroll. In American politics there are very few clear dividing lines. 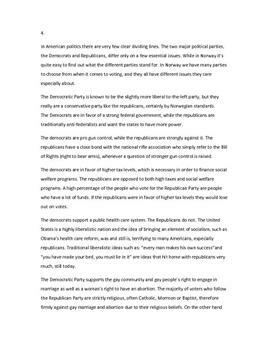 The two major political parties, the Democrats and Republicans, differ only on a few essential issues. While in Norway it's quite easy to find out what the different parties stand for. In Norway we have many parties to choose from when it comes to voting, and they all have different issues they care especially about.